West Ham were looking to bounce back from a disappointing 2-0 defeat last time out against Cardiff. Huddersfield, cut adrift at the bottom of the Premier League, are at the stage of the season where almost nothing but victory will do. 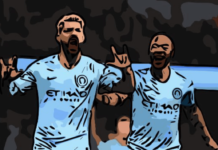 This tactical analysis will examine how Huddersfield used a narrow shape and vertical passes to pose more of an attacking threat than they have managed for most of the season. West Ham eventually managed to adapt to Huddersfield’s shape to make an impressive comeback. Throughout the first half, Huddersfield placed great emphasis on playing vertically through central areas. This could be seen in the awarding of the free kick for the second goal. Jonas Lossl played a flat vertical ball to Alex Pritchard in the centre circle who was able to receive on the half turn and dribble towards the West Ham goal. Pritchard was supported by forward runs from Aaron Rowe, Karlan Grant and Chris Lowe. They managed to combine using one and two touches in central areas before Ogbonna fouled Pritchard. Key to Huddersfield’s ability to play out from defence was the passing ability of Terence Kongolo. Playing as the left-sided of two centre backs he provided more passes (36) than his defensive partner Jon Stankovic (25) with a passing accuracy of 83.3% which was only bettered by Aaron Mooy for Huddersfield. 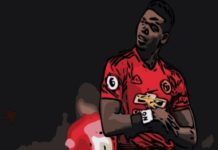 It was noticeable that he was attempting to play most of his passes forward into one of the midfielders, in turn breaking at least one line of West Ham pressure. These forward passes enabled Huddersfield’s midfielders to receive the ball and turn to attack the West Ham defence. Huddersfield’s third goal of the game came from a vertical pass through the pitch from Kongolo. After a spell of patient possession in which Huddersfield retained the ball on the left side of the pitch, they were forced back towards their own goal. At this point, the ball was passed to Kongolo who stepped forwards and played another pass that broke the lines into the feet of Grant. He was able to turn and curl an effort into the top corner from 25 yards. The width in Huddersfield’s attack was provided by the fullbacks as the two wide players, Rowe and Lowe, positioned themselves narrower. 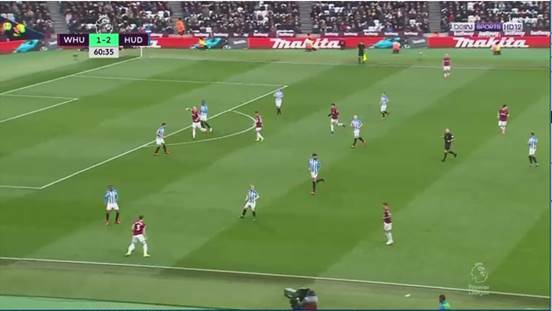 Their positioning enabled Huddersfield to play vertical passes through central areas as they were able to create overloads against West Ham’s midfield, which facilitated the quick combination passes to penetrate into the final third. 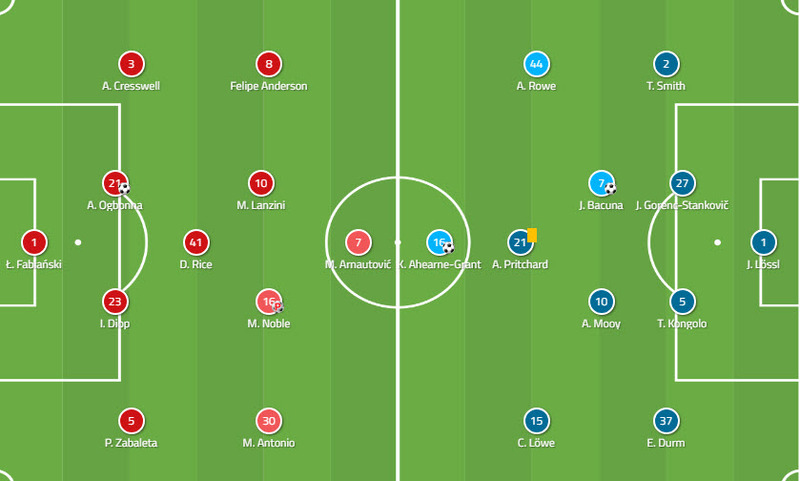 When Huddersfield had secured possession in the middle and attacking thirds then the fullbacks, Tommy Smith and Erik Durm, advanced to provide options to circulate the ball and maintain possession. 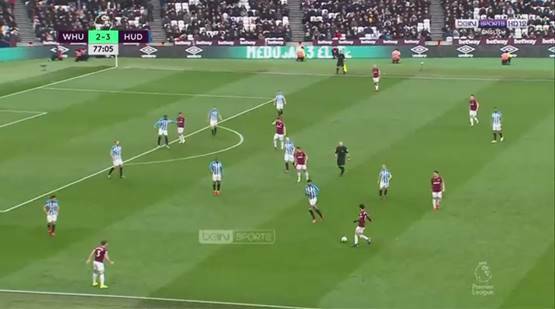 Without the two fullbacks positioning themselves wide and further forward Huddersfield would have struggled to maintain possession once West Ham had retreated into their defensive shape. A key aspect of Huddersfield’s play was the threat they posed when West Ham lost the ball. When Huddersfield won the ball in the middle and attacking thirds their first pass out was most often a forward one into feet. Unlike earlier in the season, they had runners moving into advanced areas at speed to support the ball possessor. This allowed them to secure possession if they were unable to progress the ball and circulate higher up the pitch. In the second half, Manuel Pellegrini adjusted West Ham’s shape from a 4-1-4-1 to a 4-4-2 shape. This immediately provided more pressure on the Huddersfield defence during the build-up as they now had greater access to the centre backs. This limited the time and space that was available for them to pick passes through the central areas that were so prevalent in the first half. West Ham changed their focus of attack in the second half as they started to exploit the spaces out wide. Due to the narrow shape of Huddersfield’s attack, there was space in which West Ham could exploit when they had possession. Whereas in the first half their fullbacks stayed inside, in the second half they both pushed high and wide. Manuel Lanzini and Felipe Anderson both looked to combine with the fullbacks on their side of the pitch. Through the use of wide ball circulation, West Ham were able to force Huddersfield deeper. The deeper they went the more space opened up in the centre of the pitch. This allowed West Ham to effectively switch the ball from one side of the pitch to the other. As Huddersfield didn’t have sufficient access to press the ball they were unable to prevent West Ham from sustaining attacks. This became a real problem in the last 20 minutes of the game as West Ham desperately looked for goals. Huddersfield finally showed an attacking threat that has been missing for most of the season, scoring three goals away from home. Their willingness to break forward in greater numbers when they won possession allowed them to have more options around the West Ham penalty area. Despite a strong first half performance they faded slowly in the second half eventually retreating deeper and deeper towards their own goal. 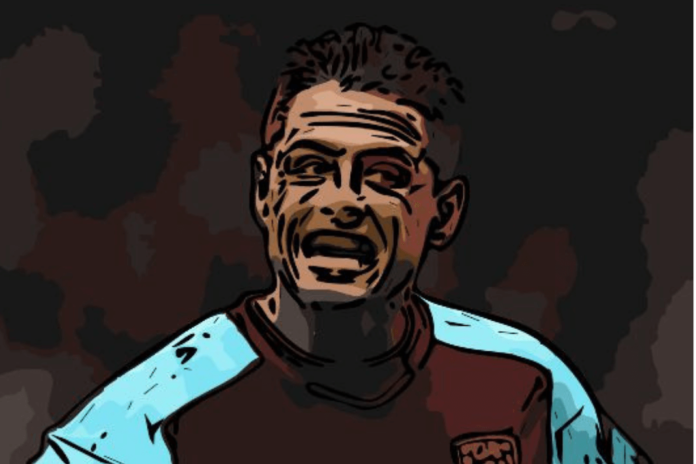 The tactical changes made by Pellegrini had a positive effect on West Ham’s performance and enabled them to gain control over the match in the second half. Previous articleHow does Rice compare statistically with his England positional rivals? 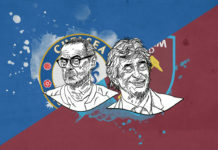 Next articleHow did Chelsea finally deliver Sarriball? How did Chelsea finally deliver Sarriball? Does Pellegrini need to change his tactical approach at West Ham? Can West Ham Keep This Unbeaten Run Going?